The other day, someone emailed me to ask about the Madsen cargo bike and how it rode. This seems to be a common question since it’s hard to find a place to test-ride these bikes. So I thought I’d put together a little post about my experiences. We have 2 cargo bikes in the household now, a Madsen (original version) with added electric assist motor, and a Surly Big Dummy with Xtracycle attachments, no longer electrified. I use them both to carry a couple of smallish children (age 4) as well as pick up groceries and do other local errands. When we set up the bikes, we lived about 7 miles from town over terrain that was quite hilly. In that situation, having the electric assist was near critical in order to make riding with all that extra weight practical and (more importantly) enjoyable! But since then, we have moved to a place that is mostly flat for everyday riding, and we removed the electric assist from the Big Dummy to make it lighter and more nimble. Now, I find that I don’t “need” the assist to get around, however, I do still use it sometimes for speed (especially for getting through the timed stop-light series in downtown). I’ve been using both bikes pretty regularly, and have found that they definitely have different advantages. This is a solid-frame longtail bike with a long platform on the back and side-bags for your cargo. 1. I love the way this bike rides. It’s fast, nimble, and feels very much like a bike of typical size. I can accelerate it from a stop quickly. It’s easy to pedal and keep moving at speed. Riding it is fun and easy, even with a load on the back. For my typical loads of ~100 lbs there’s no flexing in the frame, and while getting started is slower than an unloaded bike, once underway, we sail along smoothly. The Madsen feels like a big bike. When I ride it without using the e-assist, it’s heavy to get started and feels a bit on the clunky side. The bike is not made for speed, and I find the top comfortable speed I can pedal with the provided gearing is about 18mph. This is OK, because faster than that, I start feeling a little uneasy with this design. It’s a good excuse to ride a little slower and smell the roses. 2. 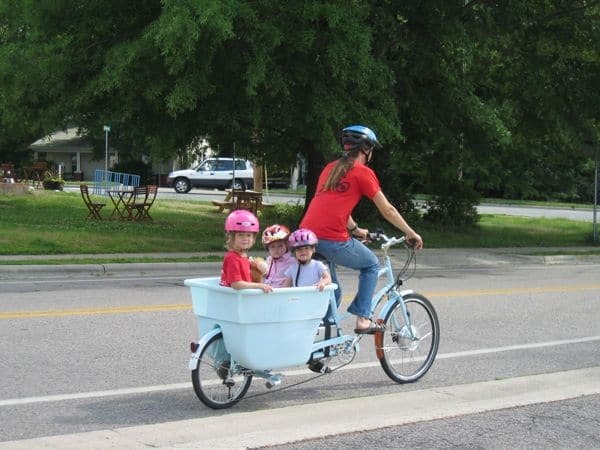 I also prefer the cargo/kid arrangement of this bike to the Madsen when picking up groceries or doing errands. The kids ride on the top. The cargo goes in the sides and they drape their legs over it. I can fit 3 canvas grocery bags on each side easily, and I tie the tops over the bags so nothing hangs out. By contrast, in the Madsen, everything goes in the bucket. This means the kids feet are on top of your groceries (eggs and all) and little hands have free access to everything you’ve just purchased. On my first big shopping trip with the twins (then only 2) and the Madsen, I put the kids on one seat, and piled all the groceries in the bucket and up on the other seat. As we rode home, I saw little bits of lettuce being ripped off and thrown out of the bike. And when we finished our 20 minute ride home, we had 3 smashed bananas with little teeth marks in the sides (2-yr olds don’t know how to peel), and a couple of ripped up cracker boxes which they had attempted to open. Overall, this was not too bad. Just a couple of curious kids with access to a whole lot of snacks…. 3. There’s a bit more flexibility in build with the Big Dummy, with different frame sizes and many different gearing options available. This works ok for us because my partner and I are only about 4 inches difference in height. So we can both comfortably ride the same frame size. It might not work as well for people of much different height. This is the bike with the bucket on the back that you can carry up to 4 children on bench seats (lovingly known among the children as “the bucket bike”. 1. This bike excels for the kid social and cooperative aspects. When we take this bike, the kids can face each other. They have hands free so they can eat snacks and no one has to hold onto someone else. They play games and chat away, point out things along our route, and sometimes even look at small books we get at the library. Occasionally, there are disagreements which require us to pull over (and sometimes remove a toy), but generally they get along pretty well. By contrast, on the Big Dummy, there is usually an argument over who gets to sit in the front right off the bat. The person in front can hold onto the handlebars behind the seat. The person in back has to hold onto the person in front. Sometimes they don’t like holding onto each other, and this has caused numerous controversies of “she’s holding me too tight”, etc. This could probably be fixed with a more complicated seating arrangement system such as many have developed, but we like the flexibility of keeping it open. 2. 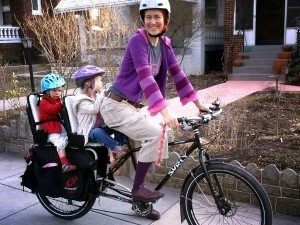 The Madsen also offers some additional flexibility if you need to pick up an extra kid somewhere. We use it to transport friends who want to come over to play, when my older daughter wants to ride instead of take her own bike (or if it’s too far or too dangerous for her). 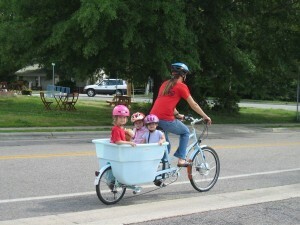 Interestingly, however, the Big Dummy actually is better for carrying small children’s bikes. So if the children want to ride on their own small bikes part way, or if they get tired, I can pick up the bike and the child on the Big Dummy. This is harder on the Madsen (although still possible) because you have to find a way to fit the bike into the bucket too. This works well with 12″ and 16″ wheel bikes. When you get to 20″ wheel, it’s harder to get the bike on the side in a stable position. 3. I LOVE the step through design of the Madsen. It’s far easier to get on and off this bike than the Big Dummy, where I have to get my leg up high over the frame bar. (this is improved some in the newer Big Dummy design – ours is from 2009). 4. The Kickstand on the Madsen rocks! It’s super wide, so when deployed it holds the whole bike up solidly. I can let go of the bike to lift kids in and out of the bucket, to load and unload, and never worry about it falling over. It’s also easy to deploy because there is no lifting of the front or back of the bike needed (unlike some double kickstands I’ve tried). Overall, which bike I take really seems to depend on what mood I’m in, what my errand is, and how many kids I have that day. We’re lucky to have both and have a choice. But if you think about how you will use the bike most often, I hope this will help you find which one fits your needs better. We also alternate between a longtail (trek) and the madsen, depending on the day/journey. Hi. Love the comparison. I’m a recent convert to cargo trikes and am wondering whether you can compare either of these bikes to a trike?